What is meant by the Good Shepherd laying down his life for his sheep? This question was posed to Dr. James Fleming, one of the most knowledgeable teachers of Biblical Archaeology, on our show Christ in Prophecy. Dr. Fleming lived and taught in Israel for 37 years at Jerusalem University College and at the Hebrew University. His first claim to fame is that he discovered the ancient Eastern Gate buried beneath the current one. Dr. Fleming has walked or motorcycled about every square mile of Israel, and is so familiar with Israel past and present that Israeli tour guides come to him for training. 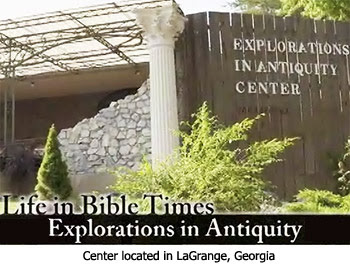 He now operates the Explorations in Antiquity Center in LaGrange, Georgia, an interactive museum where people here in the U.S. can experience the life and times of Jesus Christ in the First Century. It's a fascinating place, and so in this series we're going to tour the facility to glean new insights into the Bible by understanding the manners, customs and times of the Bible. Dr. Reagan: We are now at what looks to me like a Bedouin tent, but let's let the expert tell us what it is. Dr. Fleming: This is goat hair of a brownish-black color. When it's dry there's a very large space in the weave allowing light to shine through. As soon as it gets wet, the hair swells and it becomes waterproof. It works perfectly. When you look up towards the sun in the day through the tent it looks like you're looking at the Milky Way. The word in the Old Testament for the night sky is the "tent of the heavens." God has just unfurled the tent in heaven. 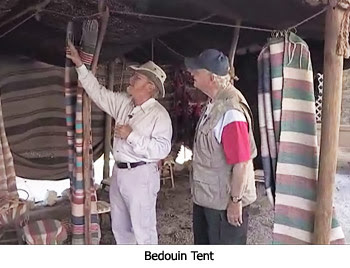 Dr. Reagan: The Bedouins still use tents like this in Israel today. You can see them on the way from Jerusalem to Jericho. Dr. Fleming: Yes, though I'm afraid they're a lot more plastic nowadays, but there still are some traditional tents. There's always in antiquity and even today among the Bedouin a divided section for a woman and children. Women would have been in one section, so Sarah would have been standing off on one side listening to Abraham talk with his angelic guests in another section where Abraham would have been receiving others. Dr. Reagan: There is a little interesting item hanging on the tent which is fascinating. What in the world is it? Dr. Reagan: Believe it or not, it's a dog collar. The predators were all around, like today it is the grey wolf in the north. Back in antiquity you had lions and bears along with wolves. 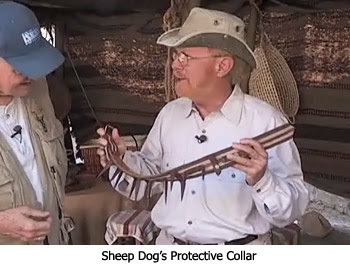 The dogs actually wore a spiked dog collar because its neck is the place the wolf is going to tear at on the dog. Dr. Reagan: Why didn't the shepherds put those collars on the sheep? Dr. Fleming: No, it was just on the guard dogs. The shepherds needed to have the guard dog for their hearing abilities as well. These dogs were huge watch dogs. Modern day shepherds even cut the dog's ears today so that the wolves won't have the chance to bite onto something. The main point is this — most people don't realize how dangerous it was to be a shepherd in biblical times. When Jesus said the shepherd lays down his life for the sheep, He meant it. I'd imagine people living near grazing areas would hear every week of a shepherd being attacked. For example, David talked about killing a lion and a bear, so such attacks were pretty common then. In the third part of this series with archaeologist Dr. James Fleming at his Explorations in Antiquity Center, we'll glean some biblical insights by learning what life in the First Century was like when it came to housing sheep. I hope this will be some of the type of learning we will be able to do in the eternal state. To get an expansion on these fascinating details, not from our limited knowledge of "experts", but from those who were there with first hand experience, that I think will be very exciting. Not that I don't enjoy this article, but I am looking forward to THE DEFINITIVE telling of Biblical history to come. ...not only these people but everyone who was alive then and not mentioned in the Bible that have some stories to tell. This makes me wonder about 2 things. 1. Do the people who have passed on know what is happening on Earth now? I really have never relished the idea of loved ones passing on being able to "watch over" us. I don't want them to see the bad choices I make at times. Because of this, my sense is those that are passed on are NOT in tune to Earthly events, or least not able to tune in like watching TV to see what we are up to. So, if they don't know, we will get to share stories from our times with them. I think that would be cool. 2. Will we even still have knowledge of our life experiences? Will human history even be relevant or just wiped from memory like a bad dream? Perhaps we will only study Biblical events history. Will we have a partial memory wipe and forget all the bad things in our lives but remember the good? These are questions that I wonder about. If the answer to #2 is yes, we will have some memory wipe, I guess will never know for sure since our memories will be wiped so how could we know? It's funny you should mention that, Billy. Just this morning I was thinking about how enjoyable it would be to do extensive research projects with our gloried minds and direct access to the people involved!